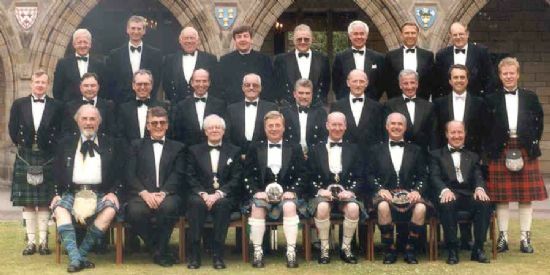 The rotary Club of Portlethen & District celebrated the 20th anniversary of their original charter dinner with a grand gala dinner held at the Altens Thistle Hotel last week. The 65 attendees included guests and partners from 14 other clubs including District Governor Jim Huston from Leven who gave a vote of thanks to the club members on behalf of the visitors. Main speakers at the event were Founder President of Portlethen & District Club Robbie Middleton, Past District Governor George Berstan who proposed the toast to Portlethen Club and STV presenter Chris Harvey who was the main speaker of the evening. 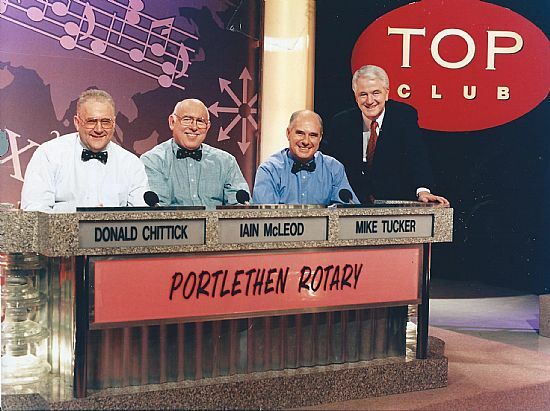 The Club was founded in 1994 as a joint venture between the then District Extension Officer Doug Westland and Stonehaven Rotary Club which acted as Mother Club to the fledgling group at Portlethen & District. Stonehaven Rotary Club was represented at the grand occasion by outgoing President Peter Newell along with Past Presidents Mike Robbins and Helen Smith. Picture taken in 1994 when the Club was founded. Another picture from the past! Muriel Thomson charms fellow Rotarians..
Honorary Member of Portlethen & District Rotary Club and Golf Professional at Portlethen Golf Club, Muriel Thomson, joined other Rotarians at their weekly meeting in the Newton Arms at Newtonhill last Tuesday evening. She gave a progress report to the members on her many endeavours working with under privileged Tamil children at Chennai in India. Muriel has been supporting children through the St Joseph Social Service Centre in Chennai, as well as sponsoring schooling and medical care for many other children over the last three years. The members of her home Rotary Club support a pupil called Vijay Kumar and all were delighted to see photographs showing how well he has settled in at his new school. Muriel will be making her next visit to Chennai in January to catch up with all at the St Joseph’s centre where her project is sponsored through the Little Drops Charity Trust. In the last three years Muriel’s workload has grown considerably with pupils now attending three schools and being supported in many ways, importantly including six monthly medical checks. Muriel’s scheme supports 23 children at St Josephs Centre, 7 children at the local Marian english speaking school and 17 pupils at the Monfort english speaking school. Muriel in her persuasive fashion has persuaded the older children at Monfort School to spend part of each Saturday attending the St Josephs centre to assist a teacher whom she also pays for, to teach English to the Tamil children living there. A further aid to english has been established through a link set up between the pupils of Ashley Road School in Aberdeen and the pupils of Montfort School. Not surprisingly it’s not all work and no play for these lucky yet needy children. Muriel, true to her cloth, supplied a Tri-Golf kit to the Monfort School and on her return to Scotland she spoke with the Royal & Ancient who were willing to help take this a step further. The R & A very kindly sent out 20 sets of junior golf clubs and some more of the Tri-Golf kits to Chennai and also spoke with the Indian Golf Union. The Indian Golf Union have now put the Montfort Matriculation School on their South India Golf Programme and have golf professionals at the school daily teaching the children. Jayanan the Head Professional who runs the programme is excited about the prospects, especially with India now becoming a force to be reckoned with in the world of golf. All the pupils at the school in first standard have been given an introduction to golf and at present the professionals are teaching those in sixth standard. Muriel’s next aim is to get golf into a Tamil school. The original reason she took the Tri-golf kit out with her was to give under privileged children a chance to try out their golfing skills because golf is still an elitist sport in India. Next year Muriel hopes to have the children at the St Joseph’s Centre included on the coaching programme. She is naturally delighted that the golf programme has taken off at the Montfort School and is now confident that junior golf in the South of India will become a big thing in the future.